Yacht Broker Gregg Silver : Atlantic Yacht & Ship, Inc.
Gregg Silver has been involved in the marine industry for over 30 years. Gregg has background experience in a variety of fields, includes vessel manufacturing, boat repairs, marine surveying, high performance engine repairs, U.S. Government vessel maintenance and deployment contracts, and eighteen years new boat and brokerage sales. Gregg’s education and credentials include a two-year Vocational Marine Mechanics Certificate, an A.S. Degree in Marine Propulsion Technology, and a Mercury Marine High Performance Diploma. Gregg is also an OMC Certified Mechanic. Gregg is Diesel Certified, and has obtained his U.S. Coast Guard 100-Ton Master License. 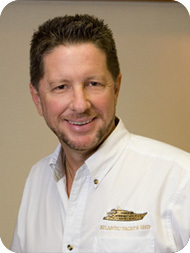 Gregg is an avid Open Water Advanced Diver, and a Member of American Boating & Yacht Counsel. In accordance with his career path, Gregg is a Licensed Yacht & Ship Sales and member of Florida Yacht Brokers Association. Now with Atlantic Yacht & Ship for over sixteen years, Gregg feels very much at home. He has experience with numerous sales of Motor Yachts, Trawlers and Sport Fishing vessels. At Atlantic Yacht & Ship, Gregg has been able to successfully apply his vast marine industry knowledge to assist his clients. Gregg’s repeat clientele and referral business are a testament to his dedication to finding your next dream vessel. Gregg owns property in Key West, Fort Lauderdale, and North Carolina and is always willing to travel to any location world wide to apply his trade & expertise.